Gluten free crepes are not as difficult to make as you might think. That’s what I discovered when I finally made them again after many years. Not only are they easy to make they are versatile. Once cooked crepes can be rolled, folded, stacked or stuffed and there is no end to ideas for filling them. This is a recipe for a sweet crepe that can be served for breakfast or dessert. My niece, Amanda, came to visit me in Calgary and asked if she could make a Crepe Cake for me to post. Great idea I thought, so we got to work learning the finer points of crepe making. We did some experimenting since Amanda bakes for her sister-in-law who can’t eat gluten or rice. We tried a few different flours (quinoa and buckwheat) but the recipe we deemed to be the winner, the one in this post, uses my homemade gluten free flour mix. This blend does include rice flour so more recipe testing is needed to make a rice free crepe. To me crepes are French and you often see the word spelled crêpe. The French pronounce the word like “step”. Of course I’m English so I pronounce crepe like it rhymes with “ape”. Regardless of the pronunciation I learned that the French are not the only ones who enjoy crepes. A little research told me that almost every European country has a version of crepes. Palatschinken is the crepe made in Germany and Austria, Ukrainian people make nalysnyky, blintzes come from Russia and in Czech they eat palačinky. The list goes on and the recipes vary, but the main message is that if all these people can make crepes you can too. Pancakes, the typical North American type, generally have a leavening agent like baking powder. Unlike crepes, pancakes are typically thicker, even if you prefer yours a little on the thin side. All my reading has inspired me to learn more about the pancakes and crepes made and enjoyed around the world. I will share my recipes as I find new favourites and have success with different gluten free flours. Just like North American pancakes the amount of sugar varies among crepe recipes but the filling you add will make the most significant difference. In France crepes are commonly sprinkled with white sugar, or spread with jam or whipped cream and then rolled or folded. Modern favourites include Nutella and sliced banana. You can use this crepe recipe with a savoury filling, I did. However, many sources say that savoury crepes should be made with buckwheat flour. This flour has a distinct nutty flavour and is gluten free so that is what I’m experimenting with now. 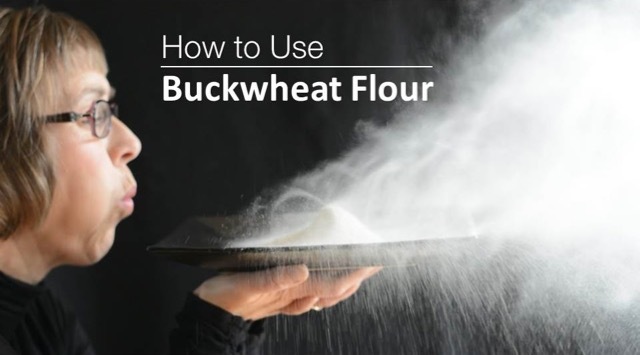 For more on buckwheat read this post, How To Use Buckwheat Flour. A crepe pan isn’t necessary but they do have some features for easy cooking. If your family loves crepes here are a few choices in the crepe pan department. I made my crepes with two regular non-stick pans. I had them both on the stove at the same time to work efficiently, keep me at full attention and to learn what temperature worked best. Try the different flippers you have, we preferred the thinnest one available among my kitchen tools. Crepe Cakes are popular these days and can look very impressive. Once you’ve mastered the art of crepe making you’re ready to tackle a crepe cake. Get practising! For this photo my niece filled these with whipped cream and drizzled them with the strawberry sauce I had leftover in my fridge. Let me know in the comments below if you tried making crepes for the first time (or the first time in a long time) and how you served them. Whisk together milk and eggs. Add melted butter, stir and set aside. In a large bowl mix flour, sugar and salt. Add egg mixture to the flour and whisk until evenly mixed. Put pan back on heat, add more oil if needed. Use a folded paper towel to wipe away excess oil and any flecks of crepe left behind. -Fill with whipped cream and strawberries. Roll up and serve for dessert. -Sprinkle with sugar or maple syrup. Fold and serve. -Spread with jam and roll or fold. Top with whipped cream if desired. -Spread with Nutella and top with banana slices. Fold and serve.